A part of my interior design work locally is being hired by a wonderful team of real estate agents to meet with clients of theirs who are getting ready to sell their homes. I walk through the clients’ houses with them, making design suggestions and taking notes to later send them, giving them as many actionable tips and bits of advice as I can. I want their house to look as perfect as it can for their listing photos. I want them to be able to show off all of its beautiful features so that it looks its very best when potential buyers come for showings. During this appointment, I’m there to give design advice for a very specific purpose and to explain just what to do and why. Sometimes just having an extra set of eyes to notice what someone has stopped noticing about their own home is immensely helpful. I aim to always leave clients feeling positive about their house and motivated to polish things up. This consultation is a little glimpse into people’s homes and lives and it’s one of my very favorite things to do. I love being part of their team, helping them best prepare for what is one of life’s biggest and most stressful changes. I see people who are on the edge of something big and I have seen the entire spectrum of emotion about just why they are there: whether they are excited about their growing family, nervous about moving to a new and unknown place, burdened by financial strain, in the turmoil of divorce, or grieving the loss of a parent, I take it all in my hands and treat it gently while I’m there. Which is all to explain why I could never and would never say to a client what I’m about to say here, at least not as bluntly as I’m about to lay it out. It goes without saying that if I can see that something is a big issue and really needs to be dealt with, I very gently broach the subject. But small things? No. I could never compromise my relationship with these people by what might be felt as nitpicking, and I have no interest in hurting someone’s feelings. Nope. Never happening. But for you, friend, I’m going to lay it all out. Maybe this is easier to do, to be completely honest, as it’s not personal. I’m not standing in your kitchen with you. I’m not looking at your bedroom right now. Best of all, maybe some of this applies to you, and maybe it doesn’t. It’s worth reading if you are thinking of making a move, though. If you are getting ready to sell your house, keep these things in mind. If you have your house listed and, despite everything seeming fine, you just aren’t having anyone fall in love enough to make an offer, maybe these are some places you could create some change. Maybe there are some things here that your team (your real estate agent, your stager, your friends) are too close to be comfortable mentioning. Like the little piece of pepper stuck in your teeth… they don’t want to embarrass you or make it awkward for them. No one wants to compromise their relationship with you or hurt your feelings, so they just hope you realize it on your own and quickly fix it. But here I am to just quietly let you know: you have a bit of pepper in your teeth. 10 uncomfortable things that no-one wants to tell you about your house when it’s for sale. I’ll start right with a tough one. Everyone’s house has a unique smell. That’s okay, and it’s normal. But the problem is when the smell is overwhelming or bad. This is such a huge turnoff for people and it really makes it hard for them to want to stay in your home, let alone live there. For the most part, you just need to take a few steps to eliminate the odor before you list your house for sale. First, get rid of or stop the cause. If you smoke in the house, it’s time to stop. If your litter box is full, time to deal with that daily. If it’s cooking smells (grease, strong spices, fish), you are going to need to not cook those things for a little while. Third, the house should be aired out. You might need to consider renting an ozone machine if opening windows doesn’t help. Fresh air solves so many problems. It’s not a bad idea to open your windows as much as you can while your house is listed as well. Life can have smells (cooking, garbage, pets, kids) and just keeping the air circulating helps so much. Fourth, be careful when adding in any scents after this process. Don’t overdo it with any artificial air fresheners, waxes, candles, or diffusers. What smells good to you can be a turn off for someone else. Clean and fresh air is the best. The bottom line: your house needs to smell clean, so do everything you can to make that happen before you list. Everyone loves their pets, probably even the people coming to look at your house have beloved pets of their own. But it still seems that people don’t want to see the mess, hair and scratches from *your* pets. For showings, it’s also best if you can tuck away pet dishes, toys and beds. Yes, people will know you have pets (especially if there any allergies in the buyer’s family, it’s important to disclose) but you just want to keep it as subtle as possible so that it’s not an immediate turn off for people. You want the buyers to subtly feel that you might have pets, but if you do they are the best pets in the world: they do not shed, eat, go to the bathroom or scratch the floor. The end. The bottom line: Clean up & repair any pet damage and do your best to keep signs of pets minimal while your house is for sale. Everyone knows how it feels to be overwhelmed by clutter. When it’s too much to deal with, most often, you just want to get away from it, right? Close the cabinet, shove everything back in the drawer, walk out of the room. Is that how you want people to feel in your home when they are considering buying it? The decision to purchase a home is a very emotional one, and those subconscious responses are the very things that guide people in those very important decisions. When they don’t want to be in your home, when their heart is saying ‘get me out of here’, they are not going to immediately want to place an offer on your home. It’s silly, but it’s true. Now, I’m not saying they won’t think things through and come to a decision that is more logic-based, but if their immediate response is a solid ‘no’, it’s going to take some convincing. Another aspect of clutter in a home that is for sale, is that for the people living in the home, they see art projects they worked on last night, things they are going to return to the store tomorrow, the mail they just put down, the forms that need to be filled out and sent back to school tomorrow. It’s fluid and it’s ever-changing. But for a prospective home buyer, they just see one thing: stuff. Without any connection to the meaning or timing of all that stuff, they just feel overwhelmed. It just looks like a mess. This can also apply to things you don’t even consider clutter, so go through your house with a discerning eye: collections, gallery walls, china cabinets, bulletin boards. Be ruthless with all that little stuff. The bottom line: Clean it up. Get rid of it. Box it up. Put it away. Out of sight, out of mind. This is a really difficult one for me to look someone in the eye and talk about, so I’m happy to cover this one online instead! I always tell clients to imagine their home bathrooms like a hotel bathroom. Logically, you know other people have used the bathroom in your hotel room before, but if you walk in and there’s evidence of that staring you in the face (wet footprints on the mat, toothpaste in the sink, a hair on the toilet seat)? Gross. And that’s just how potential buyers feel about your bathroom. And if you are honest with yourself, you feel the same way when you are looking at new homes yourself. My best advice here is the strip the bathroom down to ‘no signs of life’. No toilet brushes, no plungers, no personal care items, no magazines, no toothbrushes, no used towels. Put the garbage can into the cupboard (pack what’s in the cupboard right now, you know you don’t use most of it often anyway!) I even suggest no bath mats – the main reason here is that it’s hard to keep them perfect before showings. Any stray hairs or wet footprints are going to be really obvious. This is great to do before your listing photos and then after that, my advice is to just keep a small basket or box with personal items in and put it back under the sink when you are done getting ready for the day. Just before showings, it’s easy enough to tuck away the things from the shower, the wet towels, etc. What should be left out in a bathroom? I like to leave out a few fresh hand towels (white always looks best but any clean, nice hand towel in a color that coordinates with the bathroom will work) and 2-3 small décor items. Some suggestions: small plant, small flower arrangement (silk is just fine and sometimes prettier! ), a few candles, wrapped bar soap, upscale hand soap pump, a small décor item. Really, just make one little grouping on the vanity, keep it simple. The bottom line: clear out all signs of life, get it really clean and leave out just a few styled decorations on the counter. This goes back to what I was saying about clutter. When your closet is packed full, disorganized and things are falling off the shelves or covering the floor, people just want to get away. There is another layer here: inner spaces (closets, pantries, garages, storage rooms) are subconscious clues to people about how the homeowners *really* are. The wheels start turning when they are standing there in your messy closet: ‘ohhhhhhhkay…. They are super messy people…. The rest of the house looks nice but I can see now that I’ve been tricked. They probably aren’t the kind of people that ever change their furnace filter either….’ And this all happens in the blink of an eye, probably without the buyer even realizing it. The other things specifically about closets is that the items there are very personal, so when they are a mess, it makes people feel extra overwhelmed. They don’t know what to look at! What’s falling out of all those bags? Why does this woman have so many old bras? Wow, are all those socks dirty? You don’t want people thinking 100 miles an hour about what the heck is going on with your life and how they just want to get out of there. What you want them to see is a closet that can hold *their* clothes beautifully. That’s all you want them to think about. Now, honestly, these people have just left their own house with their own messy closets that they feel just fine about, so no judgement here about that, but remember what I said abut clutter? People can’t see their own clutter as visual noise. Every item has a purpose and a place and is just coming or going. But in *your* house, they don’t have that connection. They just see stuff and they just want to get away from it. The bottom line: remove as much as you can (seasonal clothes can be packed away, time to donate things you’ve been meaning to, etc), line up clothes by color, keep shelves neat and clear the floor completely. It’s awkward to be in the bathrooms and bedrooms of strangers. It just is. You can make people feel more comfortable by doing a few things (and remember, being comfortable is the first step to wanting to buy your house!) These tips apply to the whole house, really, but are critical in personal spaces like the master bedroom and bathroom. Make personal spaces as clean and generic as possible. I know this will feel odd to you and might even be a bit of a hassle before showings, but please trust me that it is worth the effort. On nightstands, try to remove all personal items. Kleenex, lotion, heart burn medication, used water glasses. All of it. Alarm clocks are oddly personal (as soon as you look at one, you immediately imagine the person in bed sleeping when it goes off, don’t you? ), so just tuck these down behind the nightstand if you have one. In ensuite bathrooms, clear all personal items. We have talked about bathroom-specific things like toothbrushes, razors, soaps, etc, but also look at things like used towels, housecoats, slippers, and scales. I know, it sounds a little over the top, but what do you think of when you see a scale in the bathroom? Are you imagining someone, maybe yourself, quickly getting on the scale before hopping in the shower? You don’t want a potential buyer thinking of anything but themselves and their family living in your home and distracting them with fleeting thoughts of you in your most personal moments, or feeling uncomfortable in your personal spaces, is not the direction you want them going. Put away all your dirty laundry and don’t have things like housecoats and pajamas hanging on the back of the door. A laundry hamper can usually be tucked into a closet and before showings, just tuck a clean towel or pillowcase over the top of the clothes. The bottom line: Make your most personal spaces as neutral and comfortable for strangers as possible. I know, they shouldn’t care, and they should understand that you have kids / you have a dog / winter snow came early / you will clean up the yard before you move / and on and on. But the reality is that they do care and they aren’t really all that understanding. The most important thing is that it’s really not a great first impression. When buyers come up to your home, they are going to take a look around and get a feel for your home before they even go inside. A messy yard, regardless of why it’s there or the fact that’s it’s truly unrelated to your house itself, says to potential buyers that you don’t really take care of things. Anything. Including your house. Not a fair assessment but it does happen. You can easily avoid giving a bad impression by just tidying up. Pick up or line up any kids’ toys, clean up pet messes, take out any garbage, move garbage cans to a place where they aren’t obvious (not right beside the back door), weed flower beds, hang hoses, mow grass or shovel the walk. All that good basic stuff you intend to do but don’t always get time for – now’s the time to take a few hours and make it happen. The bottom line: tidy the yard fully to make a great first impression and set the tone for how you care for your home, inside and out. The everyday, real honest fact about kids is that they have so much stuff and half of it is ugly or brightly colored and all of it is hard to hide. Add on to that, they want and need so much of it out every day. Kids’ stuff is not always things that can be packed away before a move. So, I get it… but… you know how *you* feel when you want to maybe curl up and watch a great movie and settle in and just relax for a bit, but there is kid garbage and mess and toys all over the damn place? And it mostly just makes you feel annoyed and overwhelmed so you just forget about starting the movie, throw your hands in the air in frustration and start cleaning up instead? Yeah, other people feel that way when they see your kids’ mess, too. And you don’t want that when potential buyers come to see your home. But, my kids need all of this stuff. Yes, every day. Yes, every minute of every day. But, my kids are unhappy about moving and putting their toys away is going to really upset them. But, I’m going to have my hands full just cleaning the adult things, I can’t be expected to keep this area clean, too. But, it’s pointless. They have toys out all day every day, 24-7, no matter what. Why bother? But, look, this is the way we live. People are going to just have to get over it. My kids live here, too. But, listen, anyone looking at this house is going to have kids, too, so they will get me and understand. I am with you, and I agree… it seems ridiculous. And at the end of the day, it’s always up to you to do or not do whatever you want when your house is listed for sale. I don’t want your kids to be upset or bored or feel displaced, either. Of course not. But, friends, I’m here for the hard truth: messes and clutter, even sweet kid messes and sweet baby clutter, do affect how people feel when they are in your home and how they feel when they are in your home affects whether or not they want to live there. Many people are able to set negative feelings aside and look at a house from pure logic (often guided by a smart realtor or a spouse that loves the home) but the fact is that you are creating resistance that doesn’t need to be there. The simplest thing to do is to reduce the volume of what you are dealing with (either declutter permanently or just pre-pack some things for your move), and then work on an easy storage plan for quickly picking up the stuff (big baskets, totes that slide under the bed, a laundry basket that can slide into the closet, whatever words for you), and then just do your best to keep things picked up through the day. Most times this can work, especially when you remember this is a short term pain for a long term gain. The bottom line: it’s worth your time to reduce the amount of kids’ toys and clutter you have out and visible when you house is listed. I don’t know why. I mean, I guess I do: someone else’s dirty stuff is kind of overly personal. And it probably smells a bit. In truth, maybe it actually doesn’t smell , but no one wants to find out for sure so just looking at it is kind of a turn off. And what have we learned? A turn-off makes people feel uncomfortable and when they feel uncomfortable they want to get out and when they leave like that, with bad feelings in their heart, they don’t want to put an offer on your house. I mean, they don’t know you so they don’t want to see or smell the dirty feet or workout clothes or funky towel smell of you and your family. The bottom line: short and sweet, just put this stuff away in closets or baskets with some kind of cover. That’s it. The basic, overarching theme of all these things is that all people want is a nice, clean, fresh slate. Even if it’s not logical, these big decisions are often guided by the heart. If your goal is to have people come to your home, feel great while they are there, fall in love with the idea of living there themselves and, ultimately, make an offer to purchase your home, then this is the game. 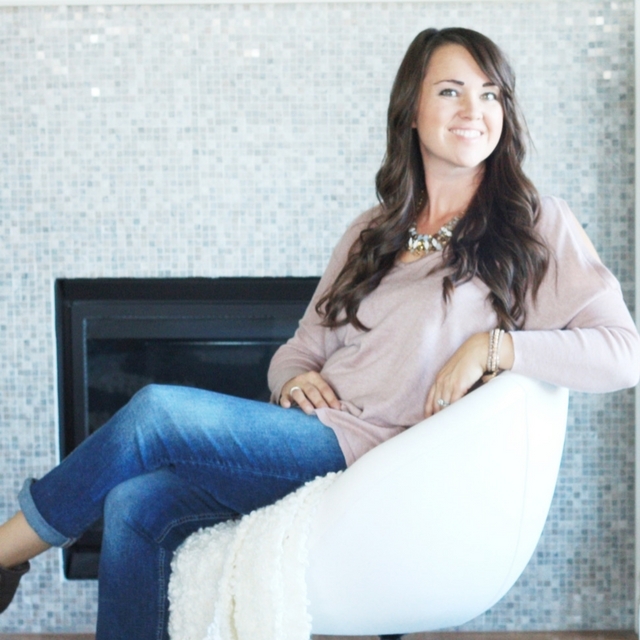 I’ve given you the insider secrets (even when I felt uncomfortable doing it! ), it’s up to you to if you want to implement them or not. At the end of the day, buying a house is a highly competitive, psychological game and you want to win. There will be other houses (lots of them!) that your potential buyers go to see. Often, several showings in the course of a few hours. Your competition might have these things covered, so sometimes neglecting these seemingly ridiculous details will have buyers scratching your house right off their list. I don’t want that for you. The bottom line: I hope that this list, though uncomfortable for me to write and possibly for you to read, has been helpful for you. I know that these hard truths are absolutely worth taking care of if they are problem areas for your home. I wish you the best of luck with the sale of your home! I’m almost ashamed to admit the amount of times that I’m looking at beautiful home photos online, admiring the feel of the room, the stunning lighting, the gorgeous styling and then it happens… slowly my eyes drift down to the area rug and all the good feelings I had for the room just vanish. All I want to do is reach in and give it a little pull to make it right. Getting the rug placement correct is all about laying a good foundation for the room. When it comes to design and styling, it’s one of the pillars of your room and it’s important to get it right. To help you nail this in your own home, I’m sharing my top 5 tips for rug placement below! Area rugs: big impact, big style, big expense. Consider these ideas to get the most impact from one of the bigger investments in your decor! The rug should be the visual anchor for most of the elements of the room. Rug placement has to do with balance and harmony. It’s a large item in the room and its placement needs to fit into the space well as well as visually bring everything together that wold otherwise be visually ‘floating’ in the room. Think of your empty floor as a wall and the rug as a large piece of statement art. Its position needs to be balanced within the room (as a large piece of art would be balanced on a wall) and anchor the smaller items in the room like the furniture (as a large frame would house the art within it). There will be pieces that do not sit on the rug and you can liken this to the smaller items that might hang on a wall surrounding one larger focal piece. The rug really needs to be centered on a major architectural element (fireplace, large windows, main focal wall) in the room. It doesn’t necessarily need to be smack dab in the middle of the room - you want its placement to be the island for the visual weight of the room. If it’s not in the middle, it needs to make sense (ie, centered on a large picture windows or the fireplace). This is something that you are going to spend some time thinking about now, and when it’s done properly, neither you or anyone else will ever notice or think about again… but when it’s off, the entire room just feels off. It’s one of those intangible things that you often can’t put your finger on. The room will just feel unbalanced and it’s not obvious right away what the problem is. As an example, some rooms have doorways and traffic paths on one side, creating the main seating area in the other. This is a classic case of placing the rug centered on the fireplace or a large window, or even a large TV console), rather than centering it in the room. In rooms with any furniture at all, the rug is the anchor for the seating arrangement (or in a bedroom, for the main grouping - bed & nightstands normally). The furniture needs to be placed in a balanced way on the rug. In practical terms, this means that if you drew a line around the inner edges of all the sofas, chairs and side tables in your main furniture grouping (where your knees hang off of a chair, for example), that circle needs to be balanced on the rug. Now, remember that ‘balanced’ does not always mean smack dab in the middle. The rug could be under only the front part of a bed, or under a seating arrangement with more in front of the grouping than behind, or at an angle under a table in an odd-shaped dining area. This turns out to be something that is quite difficult to explain but very simple to see for yourself once you know to look for it! A good rule of thumb is that either all furniture legs are on the rug or all front legs are on the rug. This is mainly determined by the size of the rug or the size of the furniture. A large rug will have room for the entire grouping (all legs) on the rug but a smaller rug might mean the groupings back legs are all hanging off. This can also be a case of larger scale furniture, where the back legs need to be off the edges. Furniture is leveled with felt pads on the back legs when they are off the rug, sometimes more than one stacked on top of each other depending how thick the rug is. In a bedroom, the rug is best placed sideways and pulled out from the foot of the bed as far as needed so that a warm place to walk is created starting from about 1/3 down the bed from the headboard and all around the foot. Turn the rug to get the look you want. The rug brings focus and importance to an area of the room and visually joins together all the smaller elements in that space, so don’t be afraid to try turning it a few different ways to see what works best to pull everything together. I try both horizontally and vertically and often at an angle as well before deciding the best placement. Ideally, you want to create a visual bubble around the seating arrangement and leave clear walking paths from room to room if needed, so think of placing the rug in whatever direction works best to accomplish that. Rotate, angle, adjust, readjust. Don’t be afraid to try placing the rug several different ways before deciding on the best placement. Don’t place a too-small rug centered under a coffee table. It looks like it’s wearing a tutu! Don’t use an area rug in a random place to fill an empty space. It would be like putting a statement broach on your arm - why? What are you calling attention to in that location? Don't overuse small rugs. These are great for inside doors, in specific work areas like the kitchen sink and as bathmats… but look messy and kind of silly when scattered all over the floor. And no, more is not better. Again, this is a case where the rug should serve a specific purpose and be visually anchored to it’s space (the door area, the bathtub, the sink cabinet). Scale is also a factor here – small space means a small rug. If you need some inspiration to get you thinking about creating a beautiful statement in your home, take a look at some of my favorites below! This post may contain affiliate links. For more information please click on the 'policies' tab at the bottom of this page. Putting together a great master bedroom is one of those things that is all for you. It’s not about what your company might think when they come over or about how your family life functions, it’s about how you feel when you go to bed and when you wake up to start the day in the morning. It’s also often the last place on the list. We all tend to put more time and effort into creating a great kitchen or into making the kids’ bedrooms magical before we indulge in making our own bedrooms beautiful. Justifying the money & time spent seems so much easier when it comes to common shared areas of the house that help everyone have a better day. I have to say, though, that the master bedroom is probably my personal favorite place to transform. It just feels so darn good to create a room that is intimately beautiful for my clients - I know it’s going to be a place that restores them every day. I believe in the power of nice sheets and soft lighting. 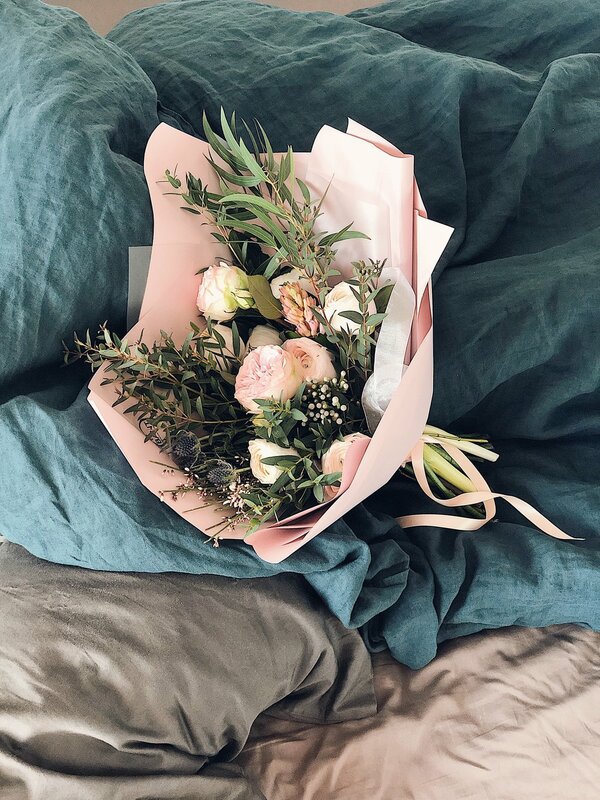 Read through my list of master bedroom staples and check out my top 24 picks and see if it inspires you to create that lovely space that restores you and yours. You are so worth it. Pick a simple color palette that consists of a neutral and one main color – you can go with just layers of neutrals if you want, or add in a color you love. Take a look at spring colors, dramatic jewel tones, or something from nature, but master bedrooms tend to look best with just one main color that is repeated in multiple places and echoed in some art or accessories elsewhere in the room. The master bedroom is a great place for soft touches of one color in many variations and shades, layered on top of neutrals - this echo and repetition of one color tends to create a soothing, relaxing mood in the room. Something thick and luxurious always looks great on a master bed. Adding some texture with pin-tucks, ruffles or ruching adds to the loft as well. If you don’t want to splurge on a high priced set right now, you can always use a duvet or comforter you already own and combine it with a duvet cover or even just a coverlet. There are lots of creative ways of achieving a rich, plush look without buying a new comforter. An old comforter, freshly washed and fluffed up, can easily be layered between a fresh top sheet and a thin coverlet - once it’s all folded down (I fold it over about 1/3 of the way down from the top and then tuck the raw edges under once more to create a really thick line), only the thick, plush folds will be visible and the old comforter will be perfectly hidden. Smooth, beautiful sheets in natural fibers are worth the investment. Look for 100% cotton or bamboo and for colors that add something to your color scheme. 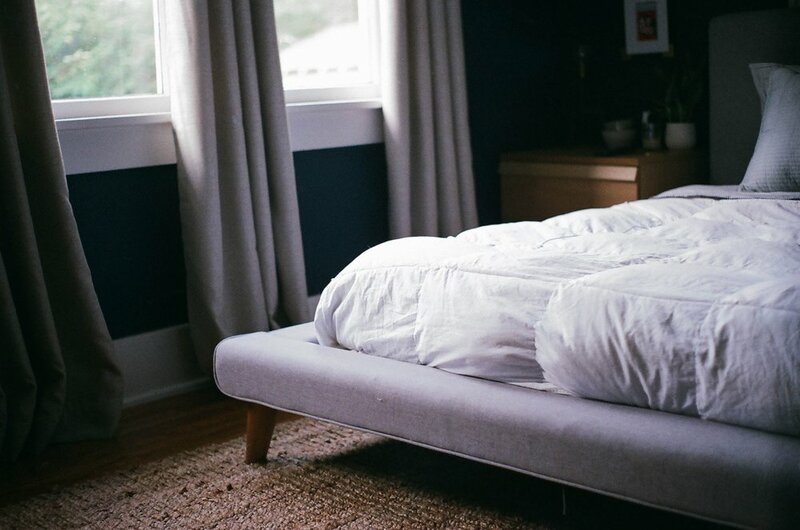 Sheets often start to look rumpled and pull off of the bottoms of the mattress edges by morning - if this bothers you, you can cover the top of the fitted sheet with an extra piece of fabric to cover the top 1/3 of the bed. I get creative here and use things like thin folded coverlets, throws, hemmed fabric and even curtain panels to lie across the top of the bed (just over the sheets but under the sleeper pillows). This trick also can bring in some color and texture to the bed. Add in layers of sleeper pillows (2, 4, 6… whatever you need to sleep with) and coordinate the pillowcases to your comforter or go with crisp white. These will form a base layer behind your decorative pillows, so although they are just practical they can still add some loft and coziness to the look of your bed and should color coordinate. If they are really not in ideal shape, consider stacking them and covering them all with a throw or coverlet, or even just hiding them under the comforter. Here is where things really start to get luxurious. I am a huge fan of throw pillows - bang for buck, I think they add so much style and coziness to the bedroom for the investment. The only downside is that you do need to remove them before bed and carry them all back in the morning. I just stack mine on a dresser top, no big deal. Is this where I confess that I have 5 decorative pillows on my bed… on top of 6 sleepers… and that my husband fully accepted the dusty pink sheets with raw-edge ruffles but said if I bring one more pillow onto our bed, we are going to have an issue? Yes, this is his life, the poor guy! Euro pillows – huge squares, 26” x 26”, these can add huge impact. Use 2-3 for a king sized bed. Texture is so vital to creating a cozy, relaxing space. You can look at the texture in your bedding, baskets, planters and other accessories, but my go-to is to layer texture in through the throw pillows and throw blankets. A small throw blanket that brings in some more color looks great folded or tossed at the foot of the bed, or folded in with the comforter at the top of the bedding (fold down the comforter about 1/3 of the way down, lay the throw on top of the fold, then tuck it under with the comforter at the fold and at the hem). Let your art bring in some personality. Bringing in color, texture, mood and style through art is one of the easiest things you can do. Choose a few statement pieces that are in line with the mood you are trying to create, rather than lots of smaller pieces with nothing to say. Lighting is a simple and beautiful way to add some coziness and warmth to the room. Choose lighting with soft shades and bulbs that have warm, soft light. Bedside lighting can be through table lamps, floor lamps, wall sconces or hanging pendants. Check out my Ultimate Bedside Lighting Guide blog post for more detailed tips & ideas. 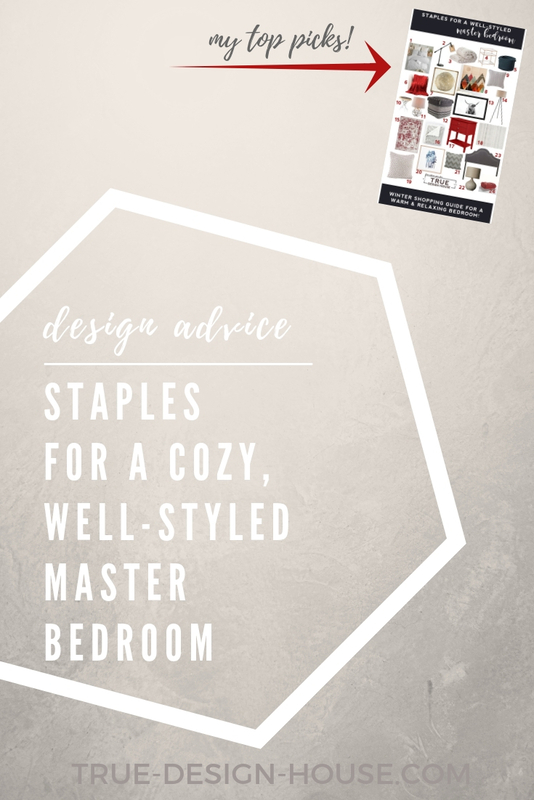 I’ve put together a list of my top 24 staples to create a warm, relaxing master bedroom this winter - check it out below! Bedside lighting is one of those details in a home that is almost equally form & function. Not only does great lighting add so much character and style to the room, but the specific fixture you choose adds vital functionality to your days (or nights). Reaching for the perfect light from the coziness of your bed and having it be just where you need it, at the perfect height and just the right brightness, is one of life’s simple little ‘good things’. Is it just me that smiles a little to myself when I walk back into my bedroom for the last time at night and it’s just softly lit by my sweet little bedside lamp and the room is all warm and glowing? Since I’m pretty sure I’m not the only one that’s in love with the idea of great bedside lighting, I’ve put together a guide with my top tips for choosing a great bedside light and a collection of 20 of my favorite lighting picks right now. So many stylish, beautiful things, I kind of want them all! Make sure the switch height is just right for turning the lamp on or off from bed. Remember: if you have a short table, get a tall lamp and if you have a tall table, get a shorter lamp. Lamp height should be in proportion to the bed (not above the headboard), the table (in good relation to both the width and height), and to any artwork above the table (you don’t want a large painting to overshadow a tiny lamp). You don’t want to get blinded by the bulb if the lamp is too high or low. A light with a dimmer or multi-level switch allows you to have quick access to soft light in the night before your eyes have adjusted. If you are a reader or want access to light when someone else is sleeping beside you, an adjustable swing arm lamp might be just the thing. Also consider shades that direct the light to your book, rather than generally lighting the room through the shade. There are so many options out there besides a standard table lamp. Consider small chandeliers, pedants hung from an overhead shelf, wall mounted lamps of all kinds, and floor lamp. You don’t have to have identical twin lamps, but you should balance both sides of the bed. This can work really nicely with a floor lamp on one side and on the other side, a smaller table lamp with a piece of art mounted above the bedside table. The bedroom is the perfect place for a burst of personality. Consider lighting in your favorite color, something that nods toward your favorite animal or something that you love but just can’t explain why. Alright, check out all of these beauties - these are my top picks right now and they are all numbered and linked below! Somehow, styling the mantle feels like a big deal. A showcase of your style and decorating on display. Yes, we want to get it right and when you nail it, it’s perfection and just makes the room sing, but don’t let that slow you down. It’s a fluid space, you can try something and rearrange and try again. You can add and take away and edit it endlessly, really. It stays fresh this way, too! Use what you love and what makes you happy – collected rocks, stacks of books, art, small collections. Match the style of the room – formal, casual, earthy & flowing, modern & minimal. Find a focal point – a large mirror, a great canvas painting, an interesting clock. Maintain balance – this does not necessarily mean symmetry, just balance the sides, both in scale of the details and overall size (height & width) of each grouping. Layer – it can add interest and warmth to layer things, slightly overlapping in front of one another. When in doubt, edit it down – too much can look messy and unstyled. The goal is style, even casual style, not chaos that creeps towards looking like your junk pile. Consider keeping family portraits elsewhere – the exception here is one or two very styled, artful images in frames that enhance the style of the room. I’m thinking more of a row of yearly school photos or portrait studio baby photos that might better be kept in a bookcase or other less-prominent place. As a side note, it can be hard to move things like this because, well, we love the people in the photos and looking at them makes us happy. If this is a road block for you, consider the purpose of styling the mantle – if it’s to enhance the design of the room and make everything flow a bit better, then maybe a few photos and frames that are more in line with that purpose can be chosen. Same people, different photos. Even editing a few special photos to black and white sometimes does the trick. There is a place for everything we love in our homes, you just need to find that ‘just right’ place. About the TV – yes, it can work. No, it isn’t ideal. From a style and viewing perspective, it’s not the best position for the TV. Some will also argue that the heat from a fireplace makes the mantle an unsuitable place for the TV. But, hey, if that’s where it needs to be, or that’s where you like it, you can make it work. I’ve done it plenty of times. Minimize the other components - DVD player, receiver, etc, should go on a cabinet, shelf or table near the fireplace, not on the mantle. Balance the visual weight of the tv with other heavy décor on each side – tall vases with tall sticks or greenery on each side, a collage of framed art surrounding the TV, a pair of canvas paintings flanking each side. Soften the bottom edge – add something long, low and visually soft below the TV on the mantle (assuming it is wall mounted and there is at least a few inches of room). A row of small rocks, a long low candle holder, a row of small vessels with greenery, a long box filled with flowers, a sign with something meaningful painted or a wood cut word or family name. Bring in the edges – add some varying height to bring the edges of your display in at the bottom corners, to slightly overlap the lower corners of the tv frame. This will soften the mantle and make the tv look like a cohesive part of the display. Candle holders, greenery in vases, plants, anything that has some height and movement to it will work. Overall, the mantle is a unique space – it’s sole purpose is decorative. There are so many other places in our homes that need to function well first and foremost, but the mantle is a place just to showcase our style, to create a feeling for the room. Have fun with it! You can find this digital graphic I created, for free instant download, in my Resource Library. Click on the image or button below to register or sign in!